Weird, two nights in a row of bands with umlauts in their names: Herman Düne and Mötley Crüe. But that’s where the similarities end. Herman Dune has more in common with Borat than with the Crüe. More on that later. I was back on my home turf tonight, a small indie rock club downtown. The trip down memory lane was a blast. Sunday and Monday were like being on a vacation to my youth (and Midtown). But today, it was time to get back to work. Speaking of work, I went straight from my daytime office to my nighttime”office.” And thankfully, the Herman Dune show was early. Slotted for 7:30, which means 8:00, at least on a Tuesday it does.I’m really getting good at timing things out, I have to say. Got there in time to grab a spot to stand, and they started within five minutes or so. 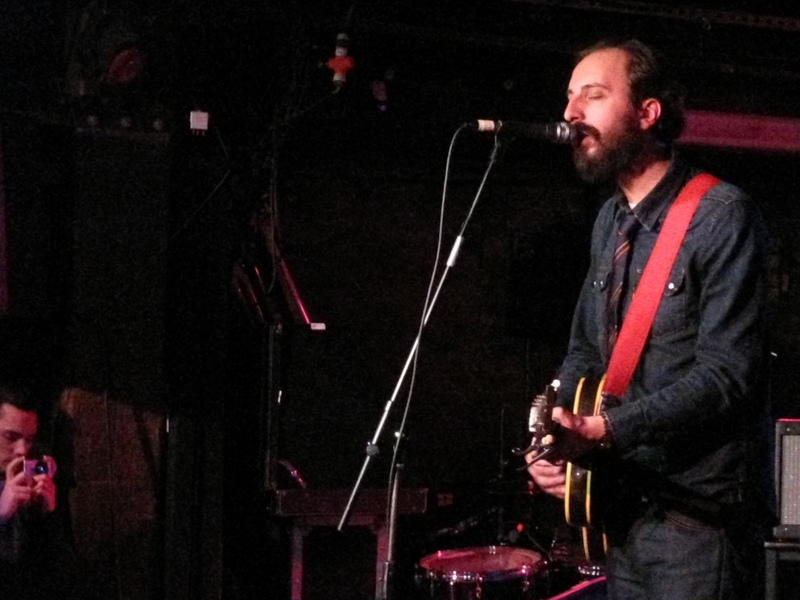 At first, it was just the singer/guitar player: David-Ivar Herman Düne. 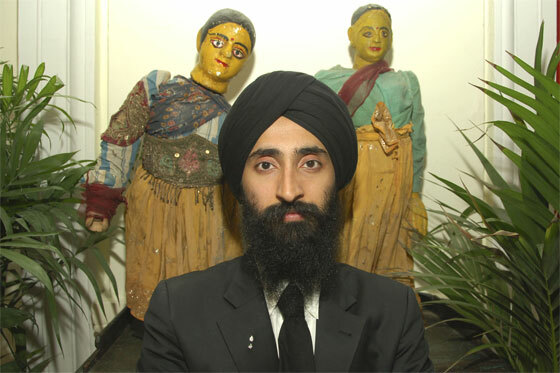 He looks like a cross between Santino from Project Runway and the guy who played the cameraman in The Life Aquatic with Steve Zissou, except he’s not a Sikh. And his accent is interesting and charming, and can sound a little like Borat sometimes, except he’s not Kazakhstani (ok, neither is Sasha Baron Cohen). Maybe it’s just his delivery? Not sure. Plus, isn’t he French? Or Swedish? Or from Israel? I can’t figure it out. Too many conflicting details on the Internets. Anyhow, these are probably stupid American comments, admittedly. But that’s what I was thinking, so that’s what I’m writing. Doesn’t matter. A crazy amalgamation like this wouldn’t be able to write songs like Herman Düne. Fun, quirky songs about things that might sound sappy or trivial coming out of someone else’s mouth. The club was pretty packed for a Tuesday. But I’m starting to see that this doesn’t matter. If it’s a good artist, there will be a large crowd – regardless of what day it is. A few songs in and the percussive half of Herman Düne, Néman Herman Düne, was on stage. They started to rock out a bit more. It was good, but all I could think about was how happy I was that it was an early show. And what I was going to pick up from Whole Foods on the walk home: Rotisserie chicken? Or hot bar buffet? Tough call. Hey, I felt guilty about it, if that’s any consolation. They eventually played their big hit “I wish that I could see you soon”,and managed to pull it off without backup singers and the extra instrumentation. Which held true for all their stuff, since they only perform as a two-piece. They played for about 45 minutes, did one last song, and then the house lights and music came on, but the crowd didn’t go anywhere. The band looked a little confused as the lights went off again and the music stopped. But they retook the stage anyhow, and played one more song. And that was the end. Of the show, and my night. It was time for some QT with my couch, after a stop at Whole Foods. © 2009 100 BANDS in 100 DAYS | Powered by WordPress | Theme 'Sirup' by 1000ff | 33 queries 0.334 sec.